Why Choose the Organizational Studies Program? 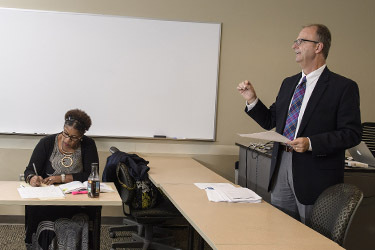 The focus of the professional doctoral program is to develop scholar-practitioners committed to exploring and expanding research related to the practices and processes of organizations. Graduates will deepen their understanding related to leadership and change within organizations. The program will provide practice in organizations and in establishing networks for education, psychology, urban affairs, health and human services. Master's degree in education, leadership, human services or a related field from an accredited university, with a 3.0 cumulative GPA or higher. Evidence of two years of successful professional management experience, e.g. Project Leader, Assistant Manager, Principal, Education Administration, Classroom Teacher with leadership role, Associate Director and/or Personnel Manager. or work in a profession where statistical competence is required. If evidence is not provided, a basic statistics course may be taken by the student prior to an admission decision. Written expository essay included with application in response to a specified topic in organizational studies. Interview with the Admissions Committee which will include a career statement (plans) and an assessment for potential doctoral level work, e.g. oral skills, ability to conceptualize issues, etc. Written responses completed during the interview to demonstrate writing ability. Graduate Record Examination (GRE) scores, Graduate Management Admission Test (GMAT) scores, or Millers Analogy Test (MAT) scores at the 50th percentile or above for education or social science majors (not more than 5 years old). TOEFL score of IBT 100/CBT 250/PBT 600, a score of 7.5 on the IELTS, or a score of 68 on the PTE for nonnative speakers of English. Two letters of recommendation from individuals who know the applicant's current work and/or academic achievements in previous academic work. Specific topics to be addressed in the reference letters are included in the handbook. Letters should be on the letterhead of the recommender's employer.